Seven weeks old " No way humans, we're not gonna wee in this cold stuff." This is an old (unfinished) scrapbook page. The pictures are from the trip we had to get Ruger & Neve from a breeder near my old home town, about 6 hours away from where we live. This was definitely Spring snow, as it was the last couple of days of September. (Remember our seasons are ‘backwards’ to what most of you experience!) 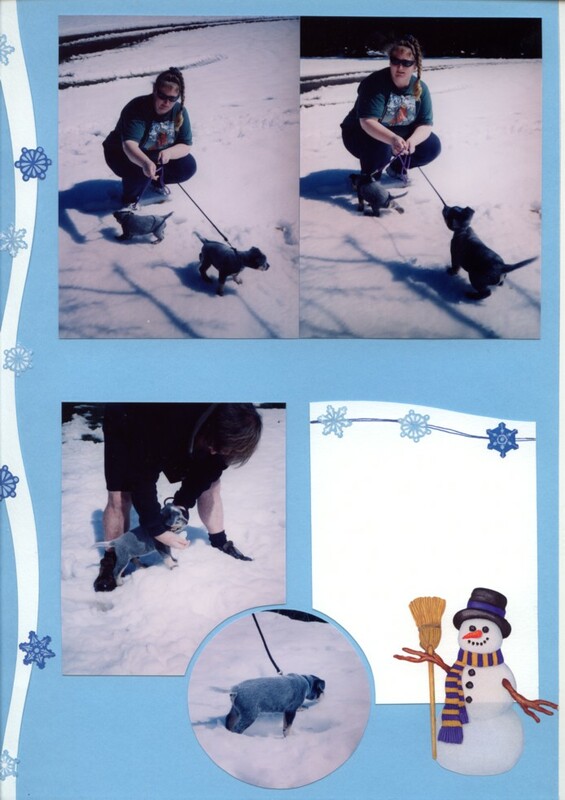 The pups didn’t really like the snow, we kept having to find/clear little patches of grass, as they wouldn’t do their stuff on the snow – and a six hour trip with two puppies with full bladders – well, you can imagine!!! SO, we made sure we found grass! I’d love to see how they would behave in snow now. But it’s snowed here twice in PB’s lifetime and that’s, well, a good few years!!!! Maybe we’ll have to make a special trip to the mountains.